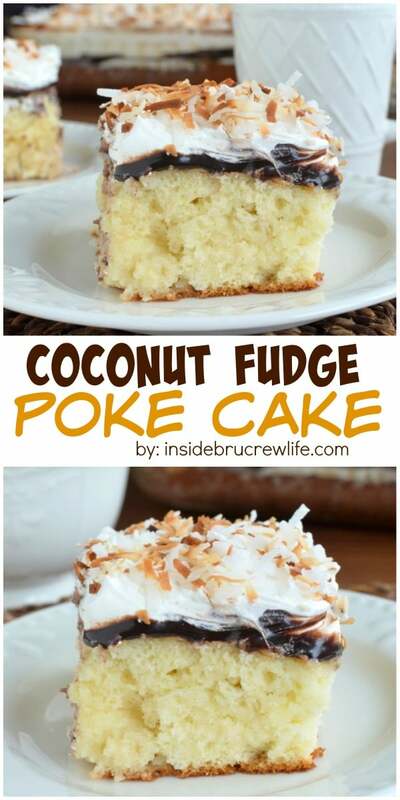 This easy Coconut Fudge Poke Cake is sure to be a summer favorite with your family. 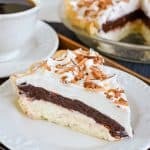 This delicious cake is topped with Cool Whip and hot fudge after being covered in cream of coconut. It is the perfect cold dessert after a hard day of work (or a day at the pool). So the other day, I was driving home from picking my kids up from school. We were stopped at a red light, and I wasn’t paying attention to the light. Apparently the lady behind me didn’t like that I didn’t move the nanosecond the light turned green. She started honking at me to go. I looked in my rear view mirror to see what all the commotion was about. There she was with her hands up in the air as if to say, “Come on already!” So, I did what any normal person would do…I let off my brake very, very, VERY slowly. She didn’t like that at all, and she whipped around me as soon as she could. What? I was going. My comment was, “She doesn’t know me and probably will never see me again.” My husband got this funny look and reminded me that we are probably the only black van in our town with a Dunkin Donuts magnet on the back. Hhhhmmm he’s right. She just might see me again. Well, as long as she doesn’t honk at me to go, we should be fine. Although, I might want to keep some of this cake in my refrigerator to use as a peace offering. I sure hope she likes coconut. I love easy cake recipes. This one starts out with a cake mix. I do love a good home made cake, but seriously cake mixes come together so quickly. (And I personally love the taste of them better.) This cake would totally work for a homemade cake though, if that is what you prefer. After it finishes baking, you are going to poke it all over with a fork or end of a wooden spoon. Make sure it has a ton of little holes for the milk to soak into. For this cake, I wanted to amp up the coconut taste, so I used shredded coconut in the cake batter, coconut milk poured on top, and more coconut on top. Now because I love chocolate and coconut so much, I also added a layer of hot fudge under the Cool Whip. I seriously couldn’t stop eating bites of this cake. Thank goodness my husband took most of it over to our church staff. This just might be my new favorite cake! 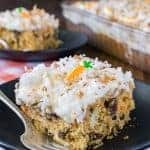 Hot fudge and three times the coconut will this fun Coconut Fudge Poke Cake disappear every time you make it. 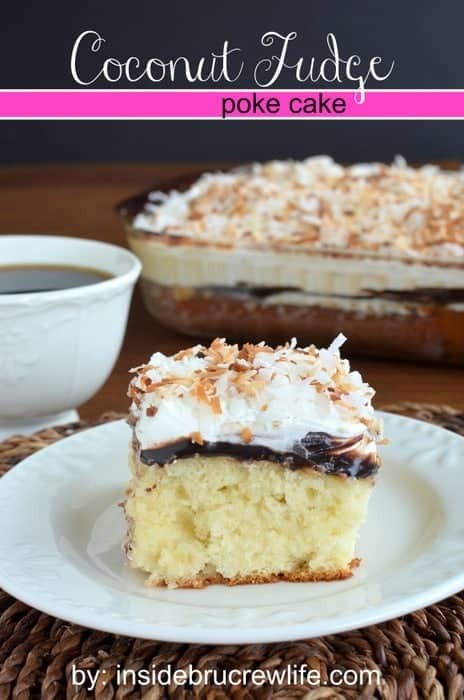 Place 1/2 cup shredded coconut on a baking sheet. Place in oven for 5-6 minutes. Stir coconut every couple of minutes while baking, so it doesn't burn. Let cool. Bake cake according to package directions for a 9x13 pan, adding 1 cup shredded coconut to the batter before baking. As soon as the cake comes out of the oven, use a fork to poke the warm cake all over. Make sure the cake is completely covered in holes. Mix the 2 cans of milk together in a bowl and pour slowly over the entire cake, making sure to fill the holes. Let cool on the counter for an hour, then refrigerate until chilled. 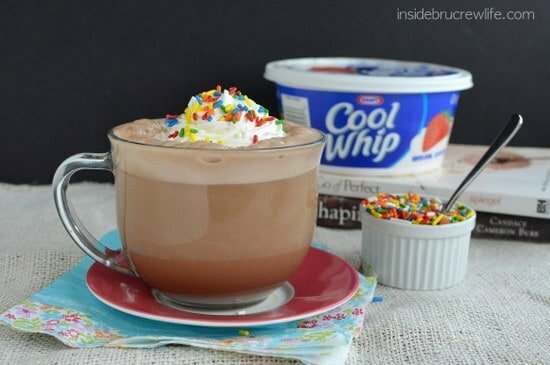 Microwave the hot fudge for about 30 seconds, or until spreadable. Cover the cake with the hot fudge. 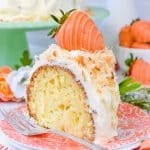 Spread the Cool Whip on top of the cake and sprinkle with the remaining coconut. Add the toasted coconut to the top for some color. Place the Cream of Coconut in a bowl of hot water for about 5 minutes before opening and mixing with the sweetened condensed milk. Yes, do it!!! It is so drool worthy!!! Wow…this sounds fantastic! Definitely on my list of things to make! I’ve had the experience of people honking at me the second the light goes green. One time it happened I looked behind me and it was two old men in a large white van, who then proceded to tailgate me the rest of the way to my destination… needless to say, I was quite scared! I love using cake mixes too- so much easier than a scratch cake! Yikes! That would totally freak me out! I think I would probably drive past where I was going just in case!!! I love coconut too Jocelyn! I swear we are sisters separated at birth!! I mean we love the same food and we’re both blonde and fabulous 😉 This cake looks awesome and thank goodness for the church staff – I would have had a hard time letting this one go! Such and awesome story!! I would have done the same thing! I mean come on lady!! Oh this cake! I have never used cream of coconut, but I have been wanting to! And I love the fuge on top!! Perfect treat for summer! You need to try the cream of coconut…such good stuff!!! Thanks for the shout out Jocelyn!!! You have no idea 🙂 It was seriously so good! I would have done the exact same thing if I was in your situation! And the cake looks peace offering worthy. Your cake recipe sounds divine! Can’t wait to try it!!! Just wondering about the hot fudge topping, is there a brand name? Thank you! I like to use the Hershey’s hot fudge ice cream topping. Just saw your bars on Karly’s roundup post and linky party. They look great but these are even better. 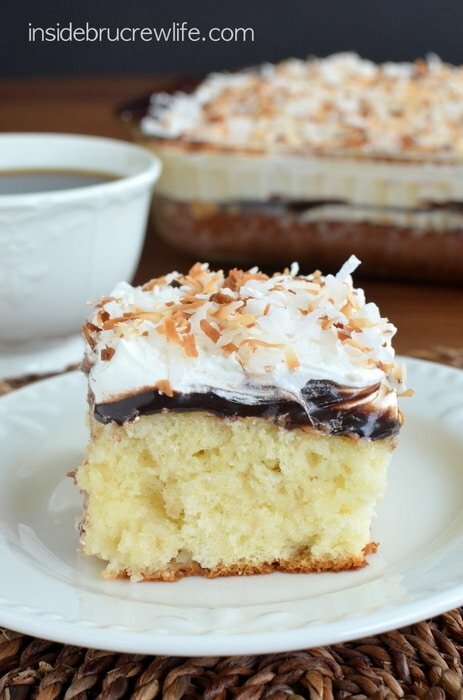 I love fluffy, soft cake and with the sweetened condensed milk….oh boy, delish! 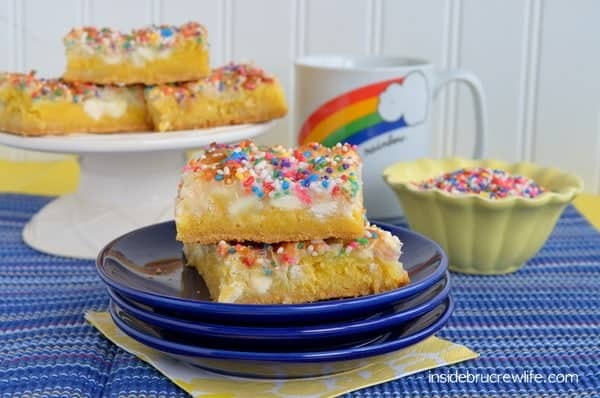 There isn’t much better than a fluffy cake with sweetened condensed milk in it! Thanks Averie!!! It is my new favorite cake love too!!! Believe me, it is easy to do!!! I’m seriously into poke cakes. This looks amazing, Jocelyn! I think I need to start making poke cakes! Thanks Ashley! I can’t wait to see what kind of poke cake you come up with!!! We can always use another good poke cake … thank you! P.S. What was that lady doing … driving while holding a cell phone? It’s illegal here in California! I’m sure that I would have been even slower than you … lol. Yeah, she was on her phone while driving. I’m not sure it that is illegal here or not. But man, she was definitely not happy with me. LOL! I probably would of done the same thing in the car. I always have my son watch the light for me and let me know when it is green, probably not the best thing to be doing but it works! The cake looks yummy. My kids always watch the light for me too…I agree not the best, but hey, it works right? Hahaha I love that story and this cake looks amaaaazing! Oh, this sounds so good! Love poke cakes! 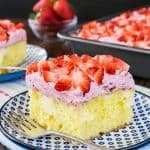 I am in love with poke cakes too! I adore soft cakes like this! I’ve never made poke cake before. I guess I haven’t lived yet. I love that fudgy chocolate layer! Soft fluffy cakes with fudge layers are so good. 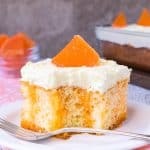 You should try a poke cake…I bet your vanilla cupcake base would make an awesome poke cake! 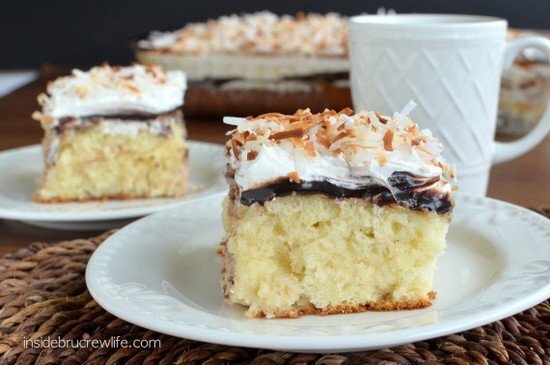 Coconut and chocolate is one of my favorite combo and this poke cake looks amazing!!! Looks so moist and so very tempting! I’m glad there isn’t any more in my fridge tempting me to come eat it. 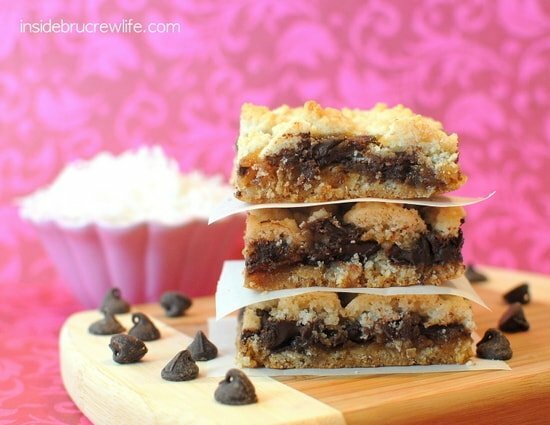 Coconut and chocolate is one of my all time favorites too!!! I buy it at Walmart and the grocery store in the alcohol section…it is non alcoholic though. Wow. 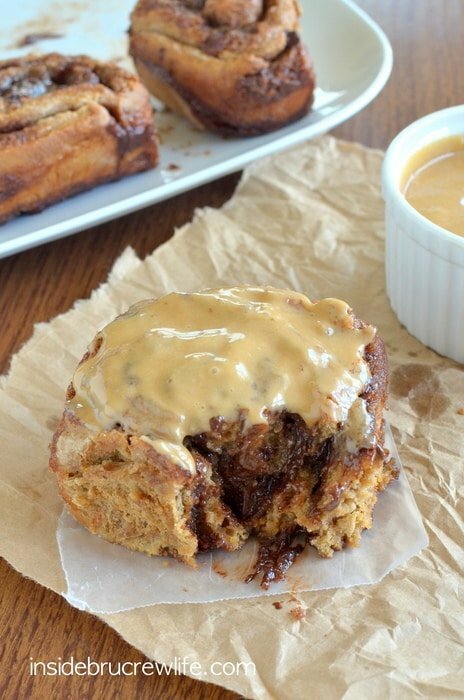 this looks insanely delicious!! I need to try these poke cakes!! Thank you so much for sharing at Weekend Potluck last week! This one is featured as my personal favorite this week. Thank you so much for sharing with us!! Love it! What did I do wrong? Made this today and the cake was sloppy wet mess. I poured the milk/cream of coconut mix when still hot then refrigerated. It still taste great just was a mess to serve!! Wish I had the beautiful slices like in your photo. Thanks for the recipe! Was it still hot when you put it in the refrigerator? I did let mine come to room temperature before putting in the refrigerator. I’m not sure that would make a big difference though. I’m glad it tasted good, but I’m sorry it didn’t set up very nicely. I have made it quite a few times and never had it be a sloppy mess. Made this cake a couple of weeks ago and it was a huge hit, though a little too sweet for my tastes. Costa Ricans LOVE wet cakes and sweetened condensed milk, so you made me a superstar. Thanks, Jocelyn! Where can I buy cream of coconut. I don’t think I’ve ever seen this product? I buy it at Walmart. It is actually in the alcohol aisle, but it is a non-alcoholic product.